Find Out Now Which Soy Isoflavone, Red Clover, Black Cohosh, and Progesterone Products Have the Active Compounds You Want! Make sure the menopause supplement or cream you use passed our test and is right for you! Women looking for relief from hot flashes and other menopausal symptoms often turn to supplements containing estrogen-like isoflavones (from soy or red clover), the herbal remedy black cohosh or creams containing progesterone. 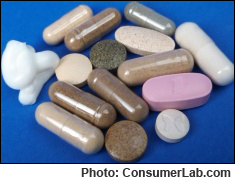 This report on menopause supplements from ConsumerLab.com provides quality ratings for 16 such products and identifies those providing amounts of compounds shown to be effective in clinical studies -- information you generally can't get from labels. The report also identifies menopausal products that failed to meet ConsumerLab.com's quality standards, such as one product contaminated with a small amount of lead. "Alternative therapies can help some women cope with menopause symptoms," says Tod Cooperman, M.D., President of ConsumerLab.com. "However, not every product can be expected to work. And it is difficult, if not impossible, to really know what's in a product and make meaningful comparisons without laboratory testing." Experts at ConsumerLab.com, for example, determined the amounts of "active" isoflavones in products, making it possible for consumers to compare menopause products to one another and to clinical standards. You must join to get the full test results along with ConsumerLab.com recommendations and quality ratings to help you find the best menopause supplement for you. You will get results for 12 menopause supplements selected by ConsumerLab.com and for four others that passed voluntary Quality Certification Testing, as well as information about two supplements similar to ones that passed testing.